On wedding day, there's often so much going on that the entire event feels like a blur. While many brides and grooms dream of a wedding filled with poignant, purposeful moments, the reality can be a rushed, hectic mess. 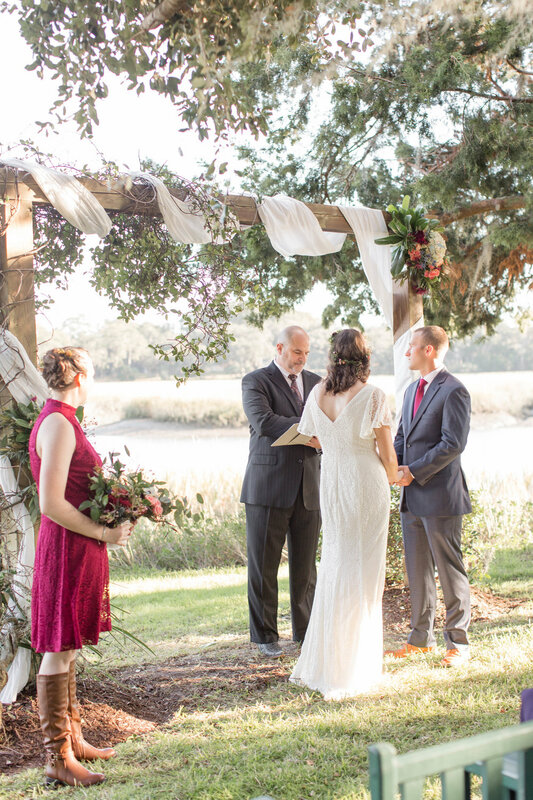 After going to their fair share of weddings together, Kristen and Jonathan wanted their Beaufort wedding on the river to truly celebrate the things that mattered to them. They set out with a laser focus on just one element and made sure everything else in the planning process fell into line behind it. Says bride Kristen, "Our word [for our wedding] was "family". We wanted our wedding to feel like just a big family event." 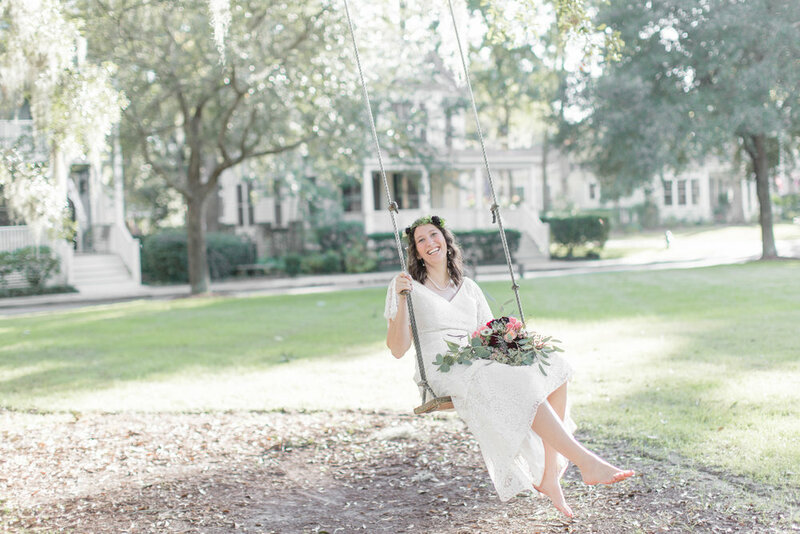 With an idyllic setting, thoughtful details, and an intimate guest list, this couple managed to create the sweet, simple, and family focused event that they wanted. Kristen and Jonathan met on an ordinary night that quickly turned into the extraordinary. Jonathan was in town visiting with a mutual friend, and Kristen struck up a conversation at a Friday night gathering while he was there. She remembers; "I had just grabbed a hot dog and went over to say 'Hi,' and Jonathan was standing there with them. We got to talking, and we never stopped talking since." That moment was burned into Jonathan's brain, so when it came time for him to propose, he escorted Kristen back to that very spot. An unsuspecting Kristen didn't see the proposal coming: "Since it was in my neighborhood, I didn't think much of it when he took me to the spot, we had walked by there several times. In the drizzling rain, he got down on one knee and asked me to marry him." 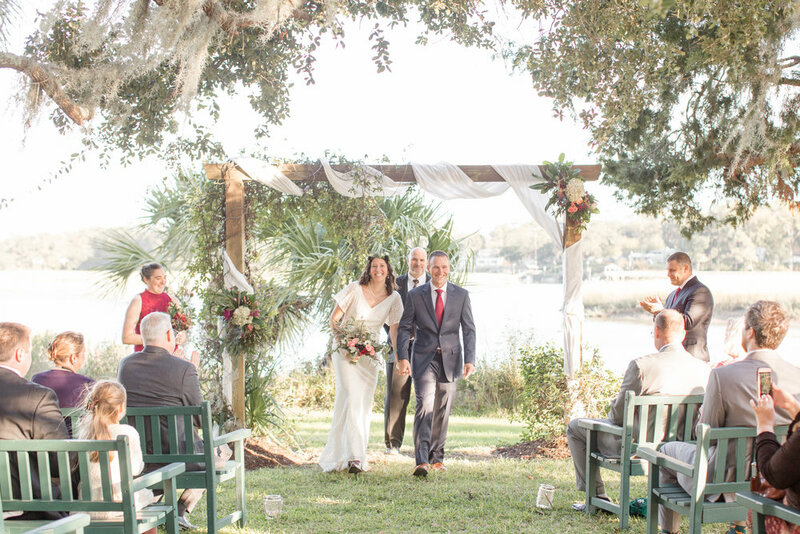 With a riverside wedding venue this stunning, the couple needed to include details that would complement their natural setting while also telling their own story. 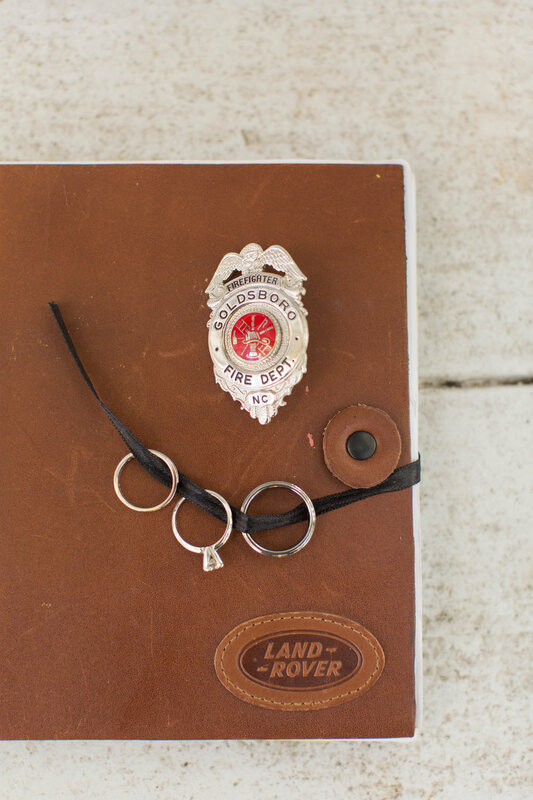 Jonathan works as fireman, so they wove elements of his career into the day in multiple ways: there was a little firebox on the cake stand, Jonathan's jacket was used in lieu of bride and groom signs, and his jacket even showed up in a few wedding photos! The favors were also a mixture of fire trucks (a nod to Jonathan) and paint boards (a nod to Kristen's artistic side). In order to create the intimate-yet-casual feel they wanted, Kristen and Jonathan took a "less is more" approach. "We kept the guest list very small (40 people) and brought in big farm tables and served the food family style. Everyone there was either blood family or friends that felt like family or from the fire department (which is family)," shares bride Kristen. On each table was a label that showcased one of the many different families the couple is in: their fire family, their Land Rover family, and their North Carolina family, to name a few. Their hard work ensuring a close family atmosphere paid off. 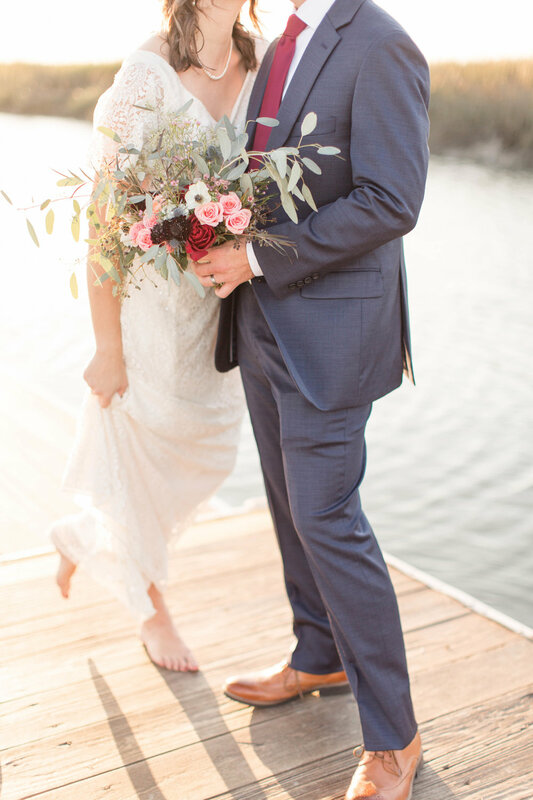 Says Kristen, "We had been to so many weddings over our 4 years of dating where we didn't even get a chance to talk to the bride and groom because the guest list was so big. It just felt impersonal to us. We wanted time to sit around the fire pit and eat good food and really be with our guests. And that's exactly what we got to do. I got to spend time with every single person there and share a memory with them." Other sweet details included the pearl bracelet Kristen wore (the same style as her sisters had gotten on their wedding day), her pearl necklace (her grandma's), their cake (the same one as her two sisters had had! ), and Jonathan's pin (which showcased a photo of his grandfather who'd passed away just a few months before the wedding).